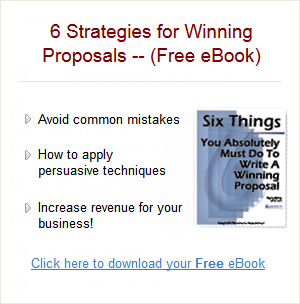 You need a team of people to write a successful proposal. The emphasis here is on “team.” Each of the team members has a role to play in the process. And each team member’s strengths compensate for the other team members’ weaknesses. The most important team member is the proposal leader. In some organizations she is the designated Project or Program Manager once you win the job. In other organizations she might be the account manager, or the sales lead. Whatever she is called, she’s the linchpin. She’s the one who knows the customer, knows his hot buttons, the concerns and issues most important to him. And because she’s the one with this knowledge, she’s really the only one of the team who has the overall big picture, the vision of how all the pieces of the proposal should fit together to carry the winning message. The proposal leader should be a good delegator; she needs to be able to hold that big picture in her mind and dole out assignments that help bring that big picture together. She should also have a talent for motivating people to keep the effort going when the fatigue and weariness sets in. Another key player is the subject matter expert. He is the opposite of the big picture person; his vision needs to be focused on his area of specialization, and he needs to be good enough at it that he can figure out the nuts and bolts of what you’re selling. He needs to be able to understand the requirements the customer has presented, and deliver the details of a solution that will meet those requirements. Ideally, this person will also have the ability to separate the wheat from the chaff—which nuts and bolts are important to include in the proposal, and which aren’t. Too much detail and the reader gets bogged down; too little, and your solution is superficial. Most subject matter experts have a tendency to give too much detail. They need very specific guidance from the proposal leader, or they will wander off into the wilderness of their own interests. You should also have a graphics specialist on board who is able to listen to what you want to say in the proposal and then prepare visual concepts that help send the message. This means they have to be good listeners, and have an open mind; pre-conceived notions will not help. The proposal team needs to be staffed with the right combination of subject matter experts led by someone with the enthusiasm to win. Otherwise, you’ll have a team going through the motions. And that’ll show in the proposal you deliver to your customer.